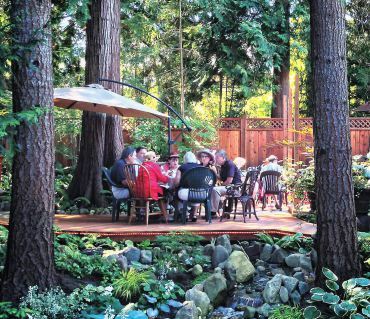 The husband and wife team of Bill and Arlene West has created a magical, wonderful piece of paradise in the Ridgetop area of Central Kitsap. 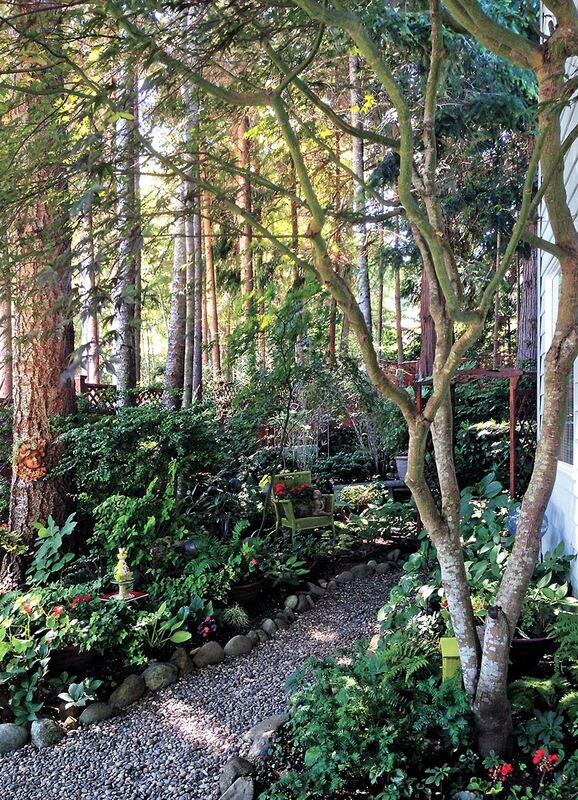 Their mostly shady garden is luxuriously green, overflowing with every kind of tree, shrub and perennial imaginable. Mature fir and cedar trees anchor the site to the land. 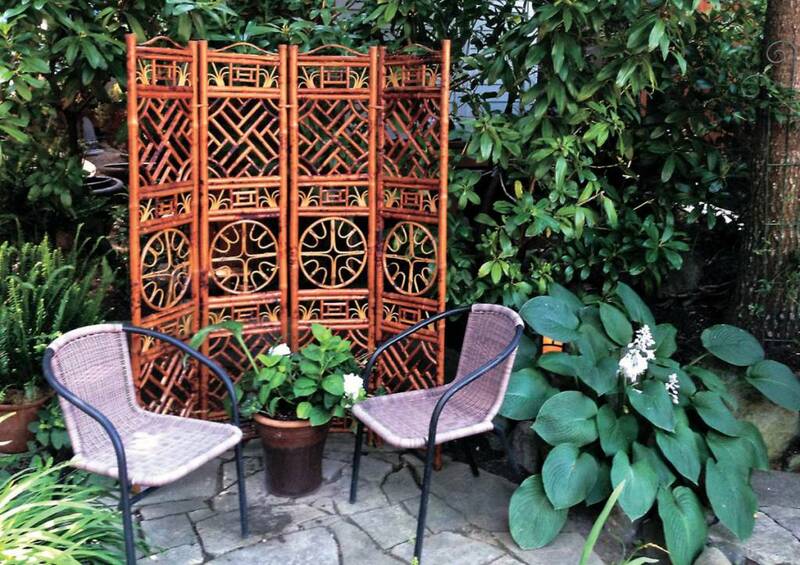 Decorative fencing and trellises frame three sides of the property. Paths meander throughout the landscape. 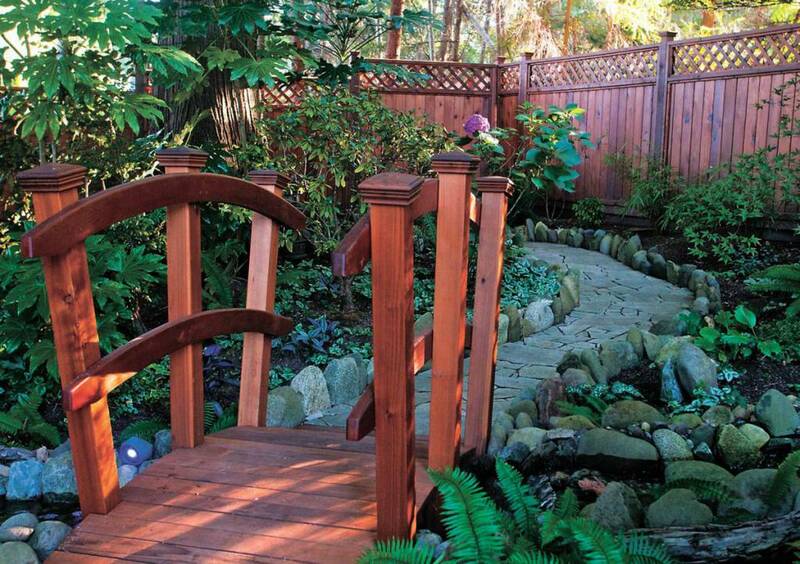 A 90-foot-long stream serpentines under and around a terraced wooden walkway in the back garden. 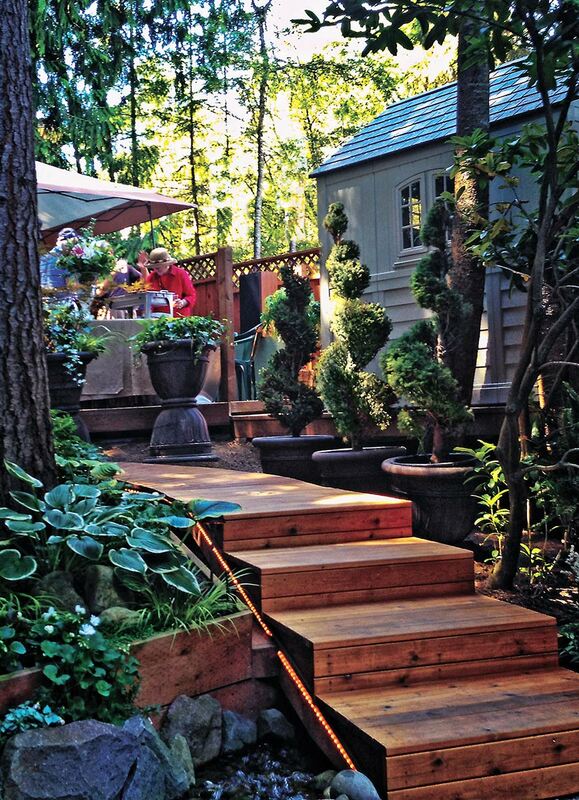 Pots, containers and garden art add splashes of color throughout. Arlene refers to the gardens as “a trip around the world.” “We have an English garden, a Wild West garden and an Asian garden,” she says. They’ve been working on their landscaping since their marriage in 2000. It is literally a labor of love. The Wests always enjoyed plants and landscaping. Their first date was to a home and garden show. “The features we really liked were paths in the woods,” Arlene says. Bill adds that he really wanted a stream in some future garden. When they began their married life together, the front yard “wasn’t too bad” except for all the ivy. It had a lawn, some shrubs, ivy growing up the conifers and a huge photinia hedge. The backyard was “pretty wild” with lots of blackberries, but the conifers provided many future focal points. There was a cement patio in the back just off the family room. 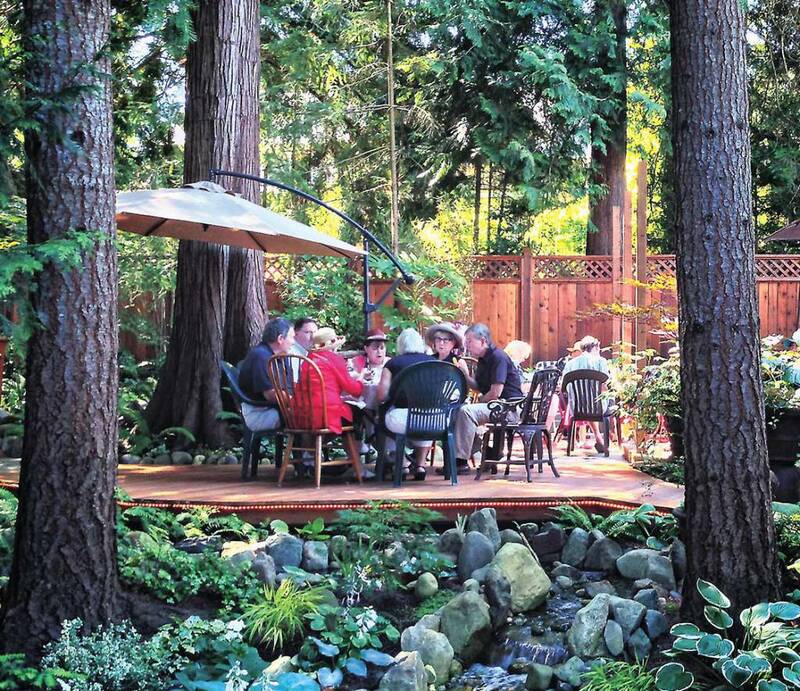 The couple spent many evenings resting in chairs on the patio, planning out future landscaping projects. “In four or five minutes of sitting, relaxing and talking, we would (and still can) come up with two or three months of work, if not more,” Bill says. Arlene and Bill are not afraid of hard work. 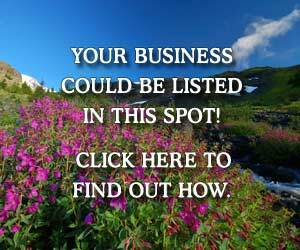 They perform all their landscaping and maintenance. The West team brings the perfect marriage of skills to their undertakings. Bill has three separate bachelor degrees — electronic, mechanical and structural engineering. His father was in construction and Bill grew up building things. 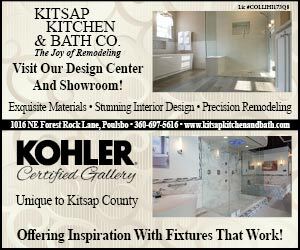 He’s always worked with tools and really enjoys creating and building. 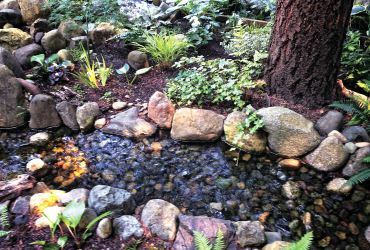 Arlene wanted to learn more about the plants in their existing garden and how to select the right ones for their particular quarter-acre site. 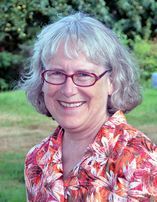 She became a WSU Kitsap Extension Master Gardener and says she uses that knowledge every day. She also is an artist and creator of garden art. The Wests put all of these skills into practice. Arlene says Bill is a visionary and anything the two of them can imagine for their garden, he is able to create and execute. Their first task was to remove unwanted vegetation and invasive weeds (ivy and blackberry vines) and bring in good garden soil. Several areas had clay soils and some areas had poor drainage. Some areas needed raised beds. At first they piled unwanted debris in their pickup truck but quickly realized they’d need a dumpster. The first year, they removed seven dumpster loads and the second year, four dumpster loads, plus additional pickup truck loads both years. When using the pickup, they’d very often bring home hand-selected rocks and pavers to use in hardscaping. 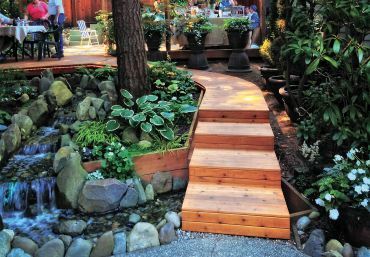 Their first paths were crushed rock and gravel that they soon replaced with other hardscaping materials. They estimate they’ve brought in 50 to 70 loads of rocks with their pickup truck. Three stately cedar trees shade the front garden. A wooden deck is built around one of the massive roots. The deck serves as a platform for a lovely table and two chairs. It also provides the entry to a greenhouse constructed in 2001. 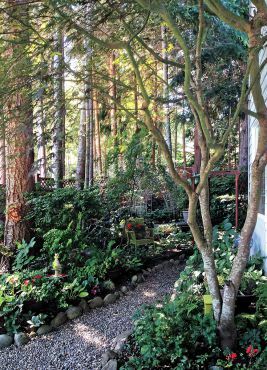 The Wests agree that they are “project-obsessed.” Arlene needed and wanted the greenhouse to overwinter tender plants and to start annual plants for color splashes in the bedding areas. “She strategically left a bunch of magazines featuring greenhouses and a Charlie’s Greenhouse catalogue where I’d see them,” Bill says. Utilizing many of his skills, he built the greenhouse with a water heater, radiant heat in the floor, a watering system and a compartment for storing pots (accessed by a door in the floor). At first Arlene would purchase and pot plants into containers rather than planting them directly into the gardens. That way she could move the containers around until she found the right conditions for those particular plants. She photographed the gardens and landscaping throughout its metamorphosis and continues to do so each season. Many of her photos are made into cards. In addition, Arlene and Bill love to visit second-hand stores, antique shops and garage sales. 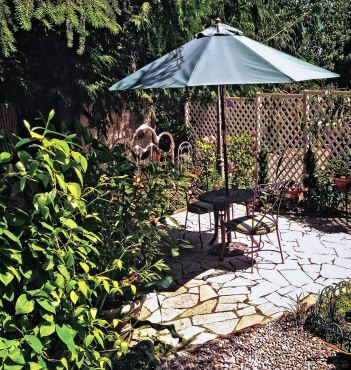 They’ve incorporated many of their finds into the garden to create vignettes, trellises and garden rooms. Arlene especially enjoys making garden art and usable art for the home out of ceramic and pottery finds. “Being creative is fun,” she says. Arlene loves hostas, ferns and hellebores because of the wide variety of choices in foliage, colors, textures and sizes. “I like them because they’re so easy-care,” she adds. Azaleas, Japanese maples, hibiscus, sarcococca and hydrangeas are just a few of the plants in the landscaping. 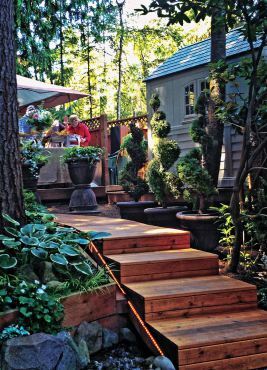 Plants for shade and dappled shade are planted throughout, with bulbs and annuals interspersed. 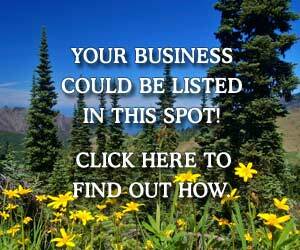 Both evergreens and deciduous plants are utilized. Her current favorite annuals are impatiens and Persian Shield (Strobilanthes dyerianus), which she often overwinters in the greenhouse or starts from seed. Persian Shield is usually sold as a houseplant or annual in the region. Its vibrant purple and green leaves splashed with silver provide shining focal points in some of the more shady areas of the garden. Arlene uses it as an annual for splashes of color and abundant foliage interest. 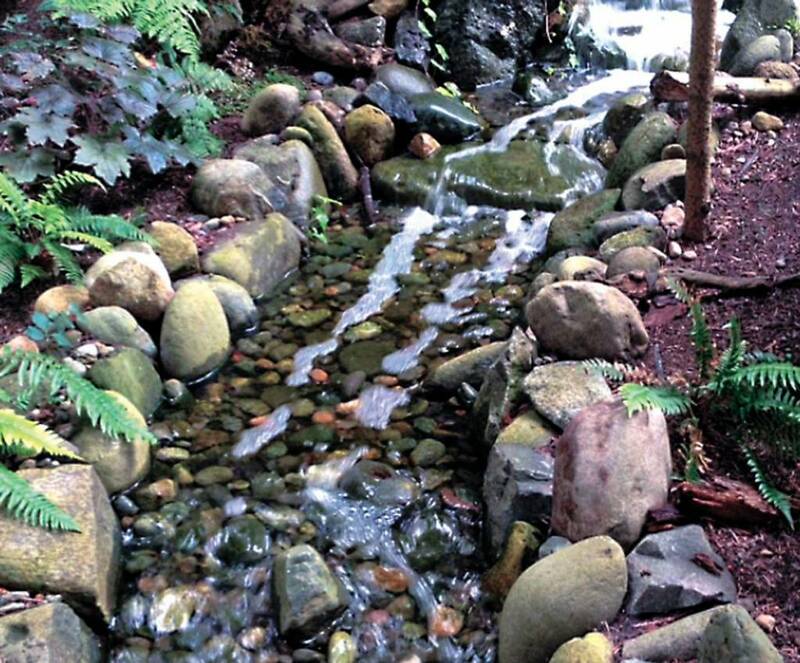 Serene sounds of water can be heard throughout the gardens. 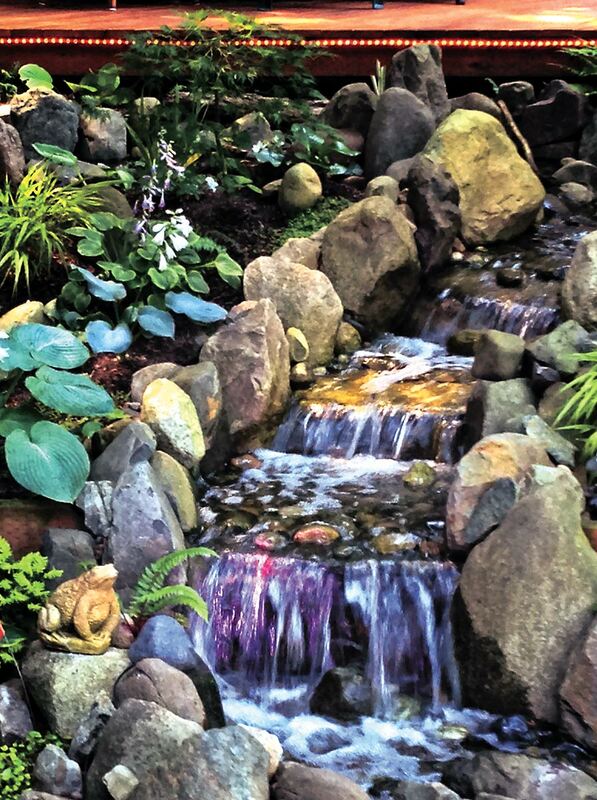 The meandering terraced stream runs all year long and is lit by rope lights mounted on the wooden steps and walkways. 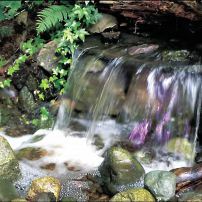 Additionally several lights that change color are concealed behind fake rocks and are set strategically, making the stream itself appear to be changing color. The pump and tank for recirculating the water are concealed under the stairs. 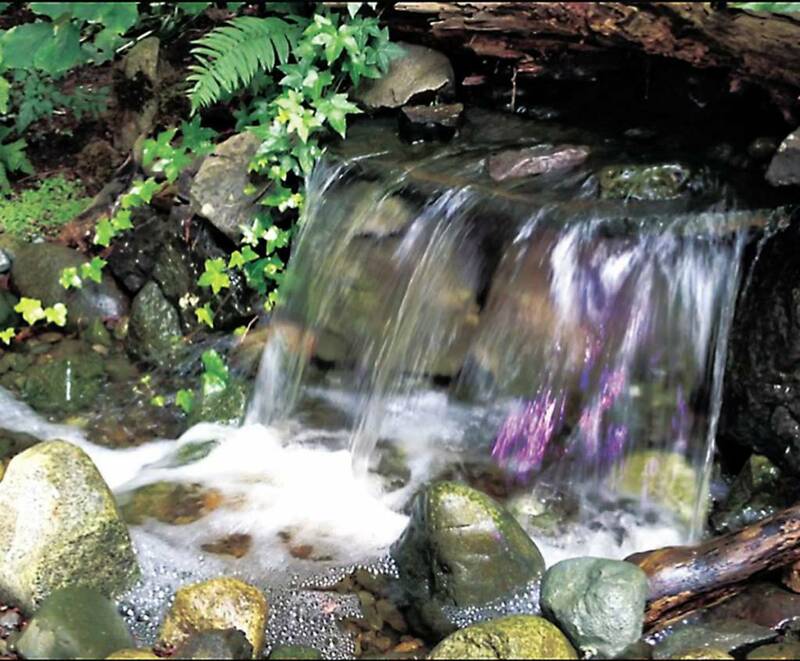 The stream is 2 feet wide throughout and 2 feet deep in many areas. The pump circulates 4,700 gallons per hour. It is all on a protection circuit. The other fountains and birdbaths are drained for the winter but they are filled with moss, ferns and other wintertime plants or cold-hardy artwork. 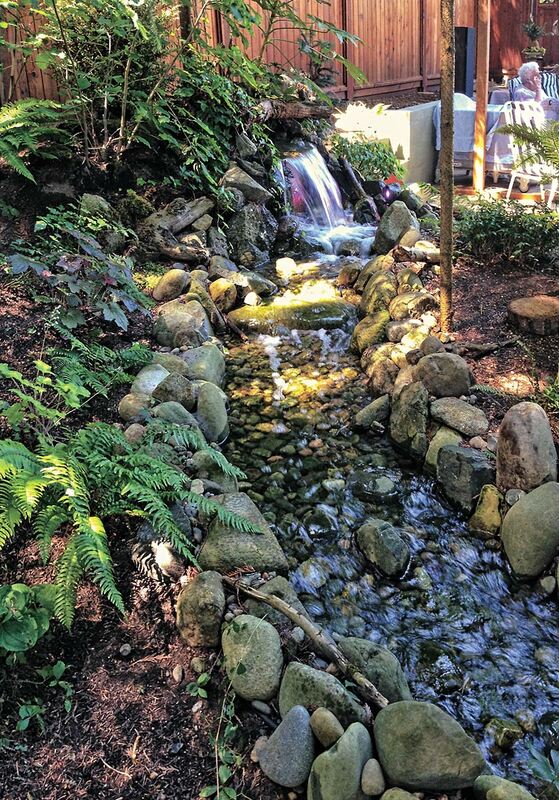 Bill has installed irrigation throughout the gardens to keep the plants healthy during the dryer months. Since the Wests provide all the labor in creating and maintaining their gardens, several small storage sheds are decoratively concealed throughout the property. Arlene has also converted several old golf bags into portable tool carts. 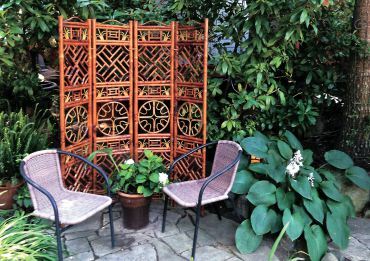 Trellises, fencing or decorative art blend the sheds into the landscape. 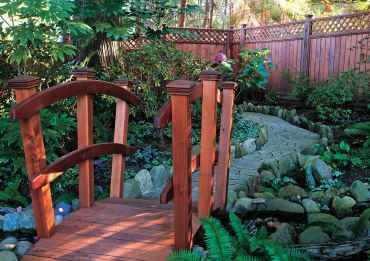 Several decks and patio areas with chairs, benches or table and chairs can be found nestled here and there for resting or snacking. Start with a plan first so you don’t have to redo all the time. Install infrastructure first (lots of wires and pipes) so you don’t have to go back and put it in later. It doesn’t happen in a half-hour TV show — it happens over years of hard work. Work with what you have. Choose plants for your soil and growing conditions. Use art, annuals and colorful containers to add color. 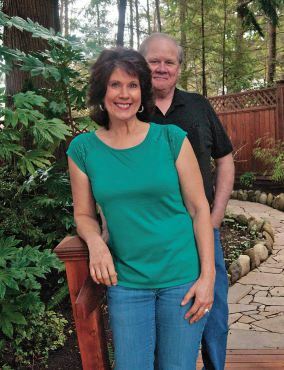 When asked what they’ll do when they’re done with all their projects, both Bill and Arlene say they’re already busy assisting Arlene’s mother and their grown children with projects indoors and outdoors. It appears this dynamic duo will be busily creating lovely gardening and living spaces for many years to come.